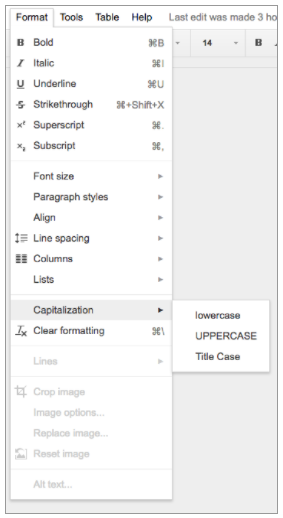 Capitalizing a large portion of text or an especially long title can be a pain. Doing the opposite—converting capital letters to lowercase—is equally a waste of time. With this launch, we're making those tasks quick and easy in Google Docs on the web. It's that easy. Like other recent launches in Docs, this feature allows you to spend less time formatting and more time on the things that matter, like strategizing, collaborating, and developing new ideas. 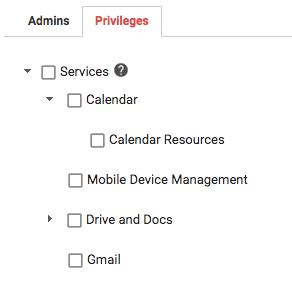 Today, we're providing G Suite Super Admins additional control over how they grant access to the Calendar Settings section of Admin console, with the addition of 'Calendar' and 'Calendar Resources' administrator privileges. Super admins can delegate the management of certain Admin console sections, by assigning system or custom administrator roles to their users. With this update, you can now delegate the administration of the Calendar Resources section (useful for facility managers) or the Calendar Settings section as a whole, simply by assigning the new 'Calendar Resources' or 'Calendar' privileges to delegate admins. Assigning these privileges will grant access to the respective sections of the Admin Console App, and through the Directory API. It will not allow management of resource calendars or user calendars through the Google Calendar App or Calendar API. Launching to both Rapid release and Scheduled release. You are subscribed to email updates from G Suite Update Alerts. Please use the attached for the agenda. Apologies. Thank you for contacting this office. I hope I have been of assistance. This message is to remind you that the FOIA Council is meeting in House Room C in the General Assembly Building, Richmond at 1:30 p.m. on Tuesday, March 7, 2017. The suggested agenda is attached for your reference. If you have any questions or require additional information, please contact us.